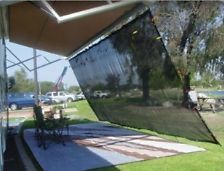 Add this feature to any awning to help block out 85% bright glaring sun on those hot summer days. Add a little extra shade under the patio awning to help with the suns intensity. SunWave Sunshades are made of high strength polyester. Backed by the quality that is instilled in all our products. SunWave Sunshade is black in color with a 3/16 poly cord that installs easily and hassle free into the same utility slot that your pull strap fits in,stakes and tie downs included. With an ample 6′ drop, privacy will be added to your patio area by the awning and shade combination. Shade will be a relief, assisted by the Sunshade on hot days. The material is specially designed to help block out unwanted wind. SunWave Sunshade can be used in car port position or standard position. Sun Shade will measure the same length as your fabric, you will still use the center of arm to center of arm measurement to order by.